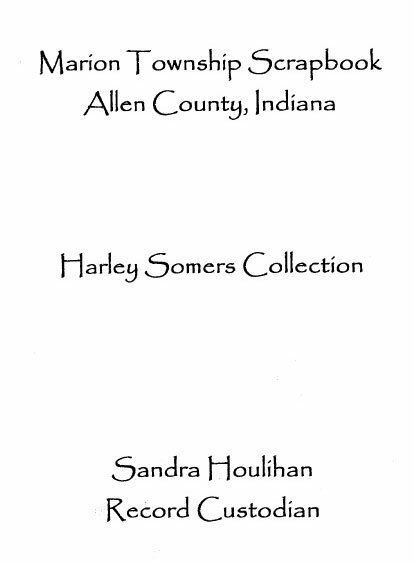 Harley H. Somers (1883-1951) was a native of Marion Township, Allen County, attended local township schools, and for a time taught school in Allen County. He later became a banker, working first for the Farmer's State bank in Sheldon (now Yoder), and later in Fort Wayne with Farmer's Trust and National Farm Loan Association. He had a deep interest in local history, especially Marion and Pleasant townships, and was an avid keeper of scrapbooks, for which he developed lengthy captions. His descriptions provide some of the most detailed descriptions of early residents in this part of Allen County.